I’m so excited to share the details of a beautiful Vintage Wedding Dessert Table I recently created for some good friends! I’ll have to say, I’m pretty proud of how this turned out! The mix of rustic and romantic elements really came together so beautifully! I think from time to time it’s ok to call my own work beautiful… isn’t it? 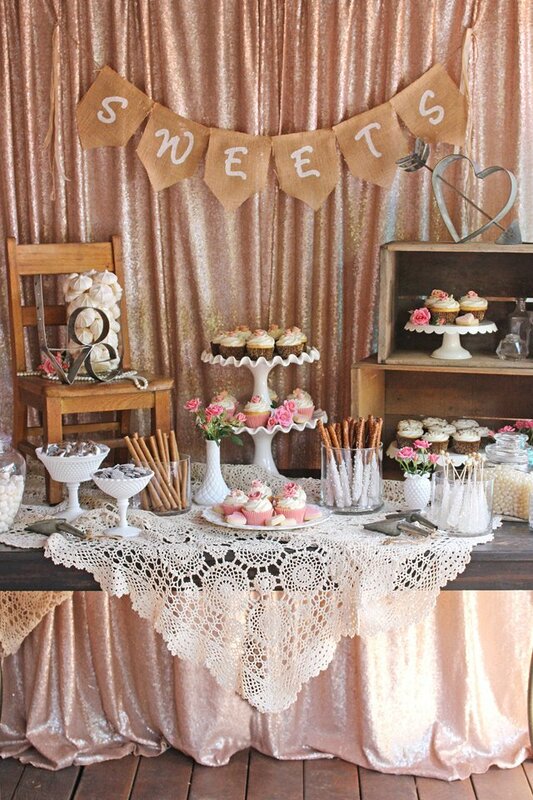 This Vintage Dessert Table was created for some long time family friends (daughter). In fact, they’re the same friends who host this incredible Luau party every year. Their home also happens to be the place where my oldest daughter (now 12!) took her very first steps! So when my friend (Shelly) shared the details of her daughter’s upcoming wedding shower, I jumped right in to help… both because I love our friends, and because I was really excited to “play” with such a pretty theme! 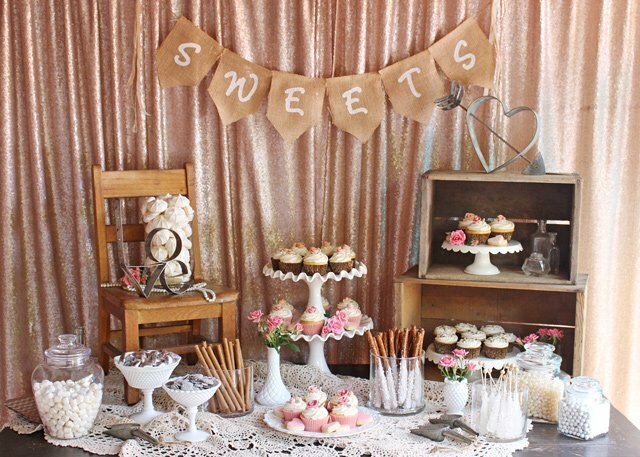 I gathered lots of pretty cake stands and candy jars (from my personal collection) as well as some props to add height to the display (including a child sized vintage chair and some rustic wooden boxes). 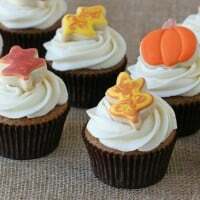 Then I planned a variety of sweets… including cupcakes and cookies (made by me) as well as lots of pretty candy from Oh! Nuts. 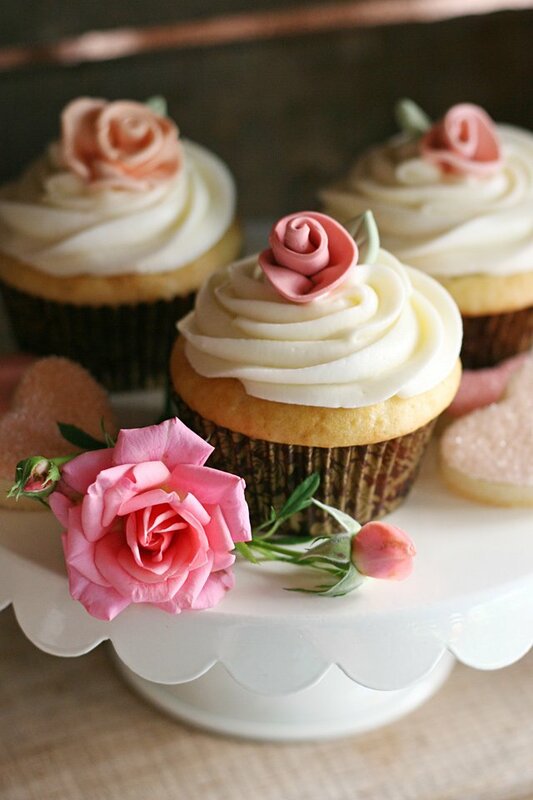 Of course it’s hardly a party without some kind of cake, so I “whipped up” (also known as spend many hours making) some vanilla cupcakes with vanilla cream cheese frosting and dressed them with pretty fondant ribbon roses (made several days in advance). Between the cupcakes, I tucked in a few little bite sized heart sugar cookies. 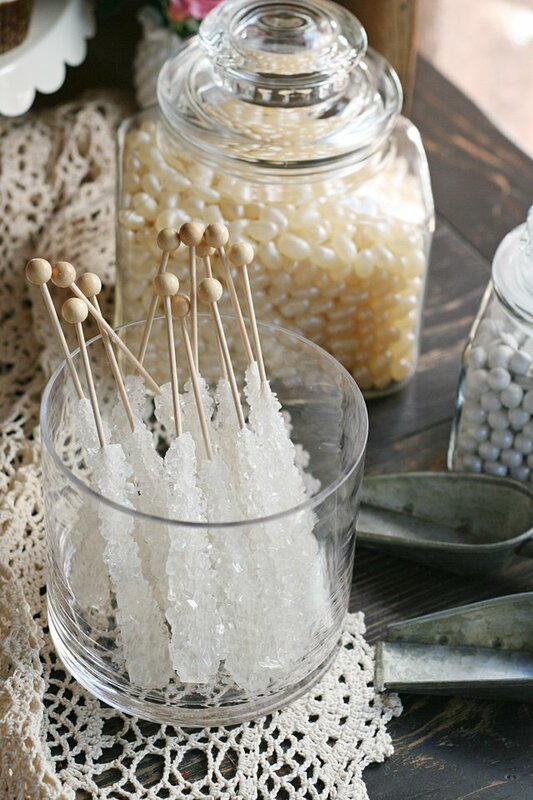 I filled several pretty jars with white, cream and silver candies from Oh! Nuts. Oh! 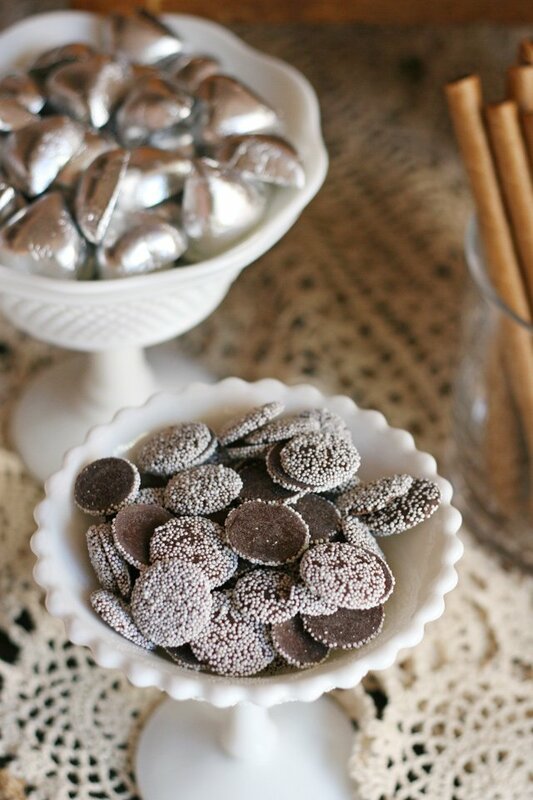 Nuts has long been my favorite on-line shop for purchasing candy for my parties! 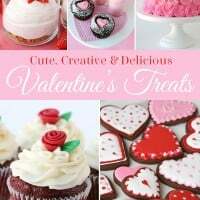 I first discovered their site several years ago when I was planning my daughter Grace’s Candy Party and I’ve been shopping with them every since! I love being able to easily shop by color, purchase candy in small or large quantities, and I’ve found that their treats always arrive in great condition! 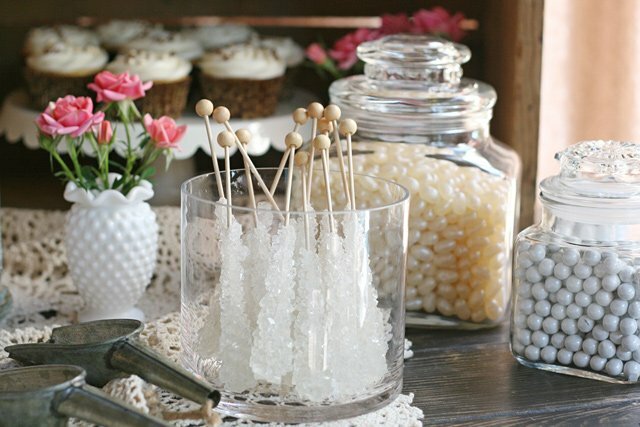 It’s fun to browse their candy buffet ideas to see how best to mix and match different sizes and types of candy. 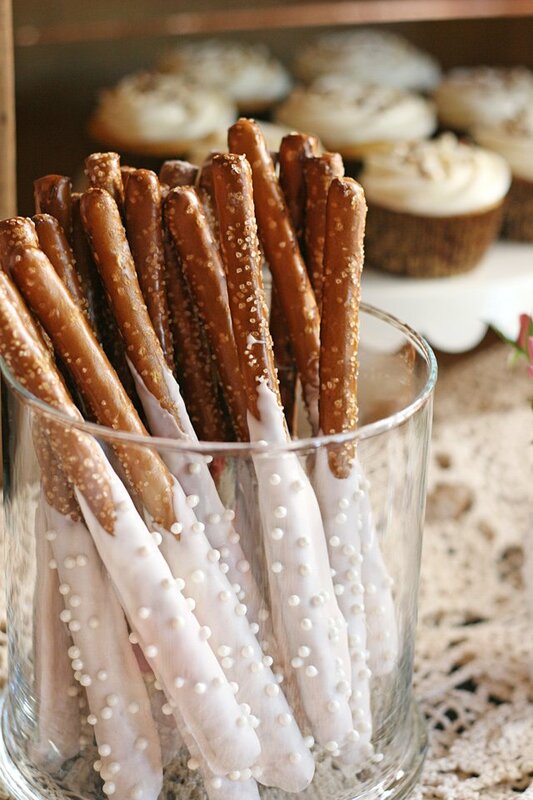 In addition to my homemade treats and lots of pretty candies, I mixed in few store bought and semi-homemade treats included simple Vanilla Meringue Cookies (from Trader Joe’s), Cocoa Batons (from Trader Joe’s) and Chocolate Dipped Pretzel Rods (made by one of the brides friends). 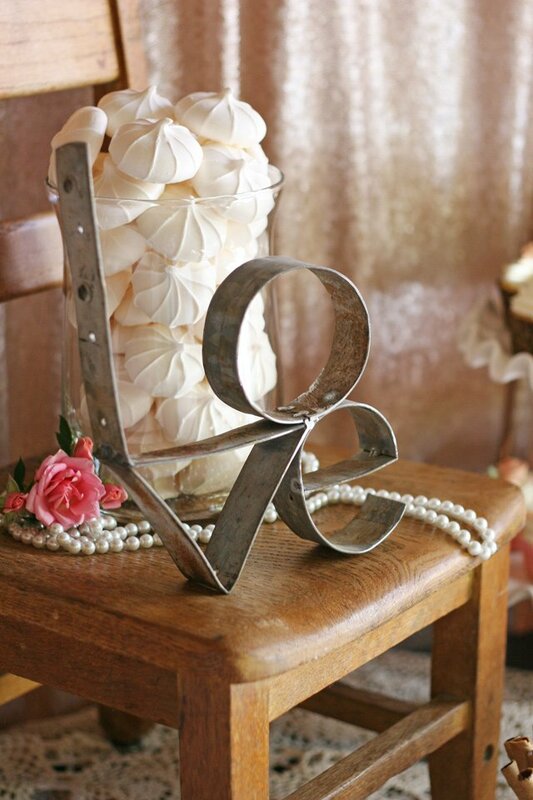 This metal LOVE sign was made by the bride’s (step) dad as well as the heart with an arrow through it that you’ll see towards the end of this post. Both metal works of art were made from the metal straps that hold wine barrels together (sorry, I’m sure there is a technical term that I’m not aware of!). I was happy to have a fun reason to use this little vintage chair too! This chair is from a pre-school my mom owned in the 1970’s. One tip I’ll share about planning dessert (or food) displays is I always set up the dishes and props ahead of time (at my house) and take a photo of the set-up on my phone. Then I can look at the photo for a few days and decide if there are changes I’d like to make. This is much better than showing up at a party with no plan and just “hoping” it all comes together. That photo also serves at my design plan when it’s time to set up. I can just look at the photo and remember which dishes to place in which spot. Of course small changes are often made at set-up, but the general design usually remains in-tact. You can see that the “before” and the actual party are quite similar, with just a few changes. 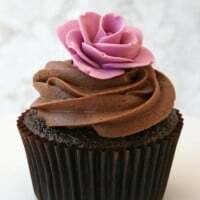 In addition to the cupcakes decorated with ribbon roses, I decorated some of the cupcakes with a simple rose swirl and some pretty sprinkles. 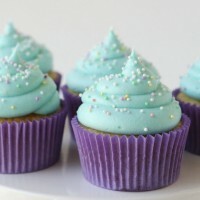 I have a simple video showing this technique in my post on How to Frost Cupcakes. Candies included white rock candy sticks, jewel cream soda jelly belly candies, white shimmer sixlets, chocolate nonpareils, and silver foil wrapped chocolate hearts. I had so much fun creating this display and I hope you enjoyed seeing and reading the details almost as much as I enjoyed sharing them! Feel free leave a comment if you have a question about any details I may have left out. 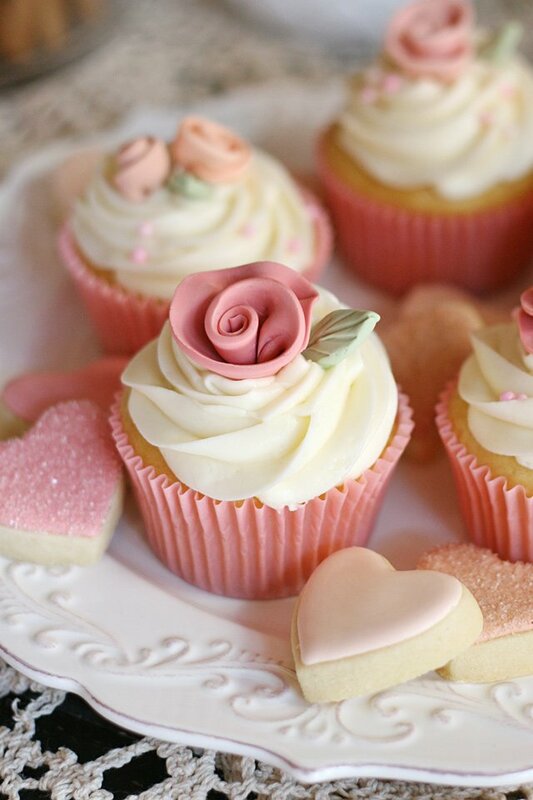 This general theme would be so pretty for a wedding, wedding shower (as in this case), or even a girly baby shower. Disclosure – Portions of this post were sponsored by Oh! Nuts. All images, text and opinions are my own. I only partner with companies I use and love. Lovely, lovely, lovely! Your friends are quite lucky to have such a talented lady to help them create such a pretty set up! So beautiful. Love the set up tips. Really beautiful dessert table! Well done. Love it all. You have put everything together so perfectly. Love the backdrop and your cake stands look amazing. Great job! This is absolutely gorgeous. Love it! 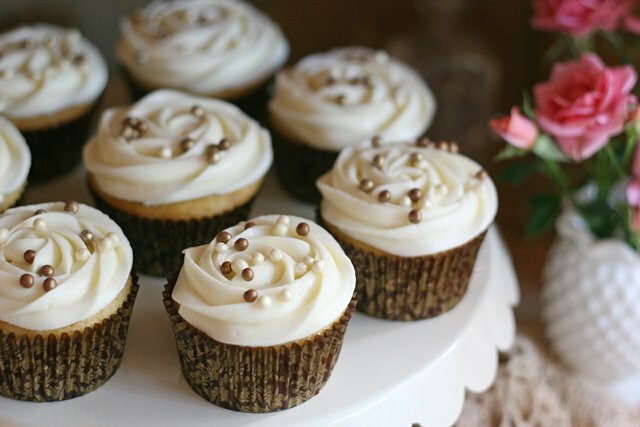 I made your perfect vanilla cupcakes a couple weeks ago. Froze some and my husband and our oldest son sure enjoyed them as strawberry shortcake. Just stunning! My sister Melissa introduced me to Oh Nuts! years ago and they have such an amazing variety of products, I can always find what I’m looking for there. You are so talented Glory! Wow Glory….you are so talented! It’s incredible that you could take the ‘set up’ (lookin’ mighty rustic) to the romantic with just a few additional props. And how did you ever choose what props to use, since I spy a variety in your glass cupboard? What I think I love the most? That it doesn’t scream WEDDING, it just whispers low key PRETTY. (and the food looks pretty sweet too) I hope you get asked to do more of these, as I see the makings of a new book–or at least an article in Stampington & Co MINGLE magazine! Thanks for sharing the process with us. Thanks so much for sharing. It turned out beautiful! So pretty! You do such a beautiful job and I know you put so much thought into all of it. Well done! 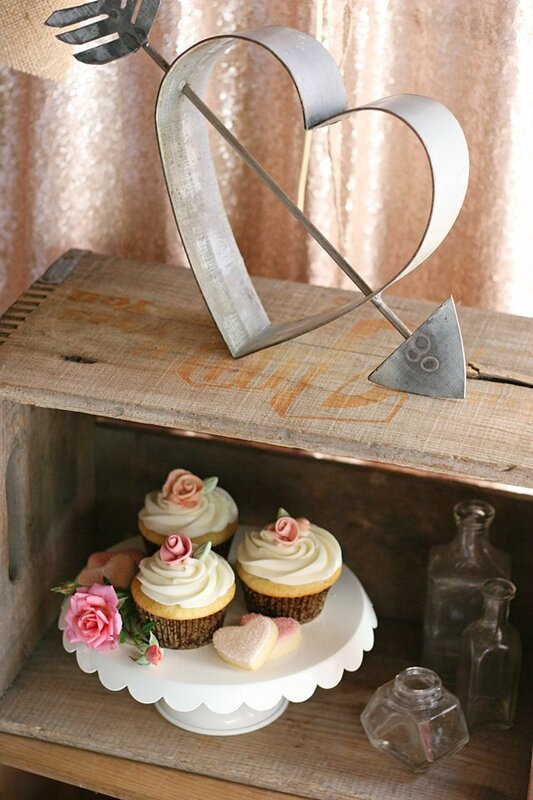 Hello , congratulations for this beautiful party and decoration , I wonder where he got these supports for cakes . What color is the backdrop? Such a lovely setup! Thank you for sharing I was wondering where you got that lace tablecloth and would you mind sending me a photo of it? It’s just so beautiful and I would love to get a better look at it. The lace table cloth was from a thrift store, and belonged to the mother of the bride, so I don’t have it handy to take any additional photos. Hi! I was wondering where you got the pink table cloth and backdrop? Hello! I love this. Where is your backdrop and skirt from? What color is that exactly ?